Join us for a fun Easter Saturday event for the WHOLE family! Join for a wonderful Easter Celebration for the whole family! First, we’ll have a family-friendly, interactive worship service led by the Rev. Dr. Kory Knott. Following our worship service, we’ll all head up to Custer Road Corner (the parking lot at the corner of Custer Road and Legacy). There we’ll have an Easter Egg Hunt and fun Family Festival! At our Festival you can play on our bounce houses, enjoy the trackless train, take pictures with the Easter Bunny, and make crafts! 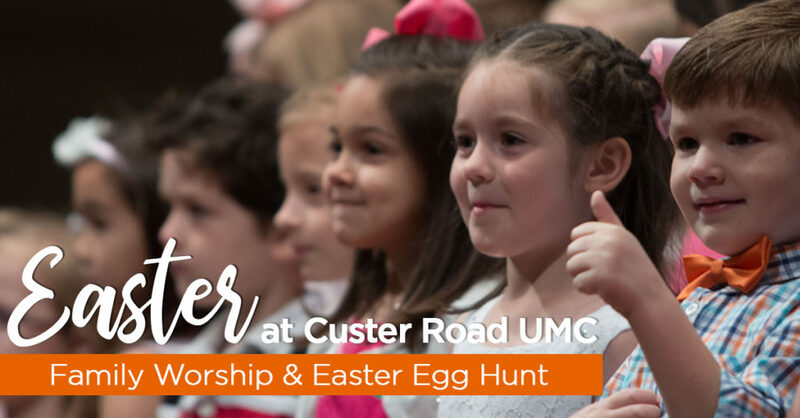 Our Easter Egg Hunt will be divided by age groups (Toddler Egg Hunt, Preschool Egg Hunt, Kindergarten/1st Grade Egg Hunt, 2nd/3rd Grade Egg Hunt, and 4th/5th Grade Egg Hunt). This is going to be a wonderful afternoon of fun, fellowship, and Jesus! Everyone is invited to this FREE event and no registration is required.